Guys as you no iv been looking for a good place to have a 4 wheel alignment in the Bristol area. Well iv found this place in the title and can recommend them also they have the latest Hunter machine. Its a small place in the sticks so hard to find as there are a few farms near with the same postcode. Hear is a copy of my results as you will see the camber once again is slightly out of spec but not to bad. The price for 4 adjustments was £65 which i think is a good price. Hear is there web page if anyone needs an Alignment. On another forum a guy has had 4 wheel adjustment and was saying he thought it was good value at £25 a corner so £65 sounds great. Yep I thought it was a very good price indeed. Also you were aloud to whatch everything they did as well. 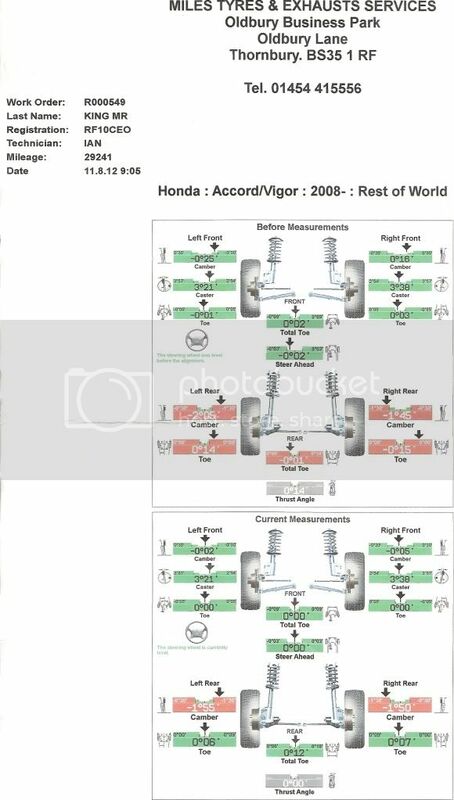 Hi Asim - no such thing as a stupid question - Accords have independent rear suspension, the trailing arms have a graduated adjuster at the front end to adjust the rear tracking - purpose - same as front wheel tracking, to make sure the wheels are tracking straight. The rear adjusters tend to seize. I'm new to the Accord, just bought an 06 model. The 17" tyres were all well worn and it pulled to the left so needed new fronts and tracking at least. Also the handling was odd - very twitchy and affected by every bump and irregularity. HiQ in Burgess Hill, who I've always had satisfactory service from, suggested new fronts and tracking front and back. They did the fronts (rear adjusters siezed but not badly out), road tested it, rang back and said - it's very twitchy etc - just like I had found - but they found a distorted rear tyre sidewall. So they advised replacing the rears as well. No real surprise considering the advanced wear anyway. What a difference!! Completely transformed, runs straight and true and feels like it should. Cost £80 per tyre and £30 for tracking and they should be good for some time now.. I'm well pleased. Excellent description Mike, just one further point, the saloon rear suspension is multi-link rather than trailing arm. Other than that, same reasoning applies. freffofrog - just tried PM'ing you, but it said you cannot receive anymore messages? is it someting i'm doing?